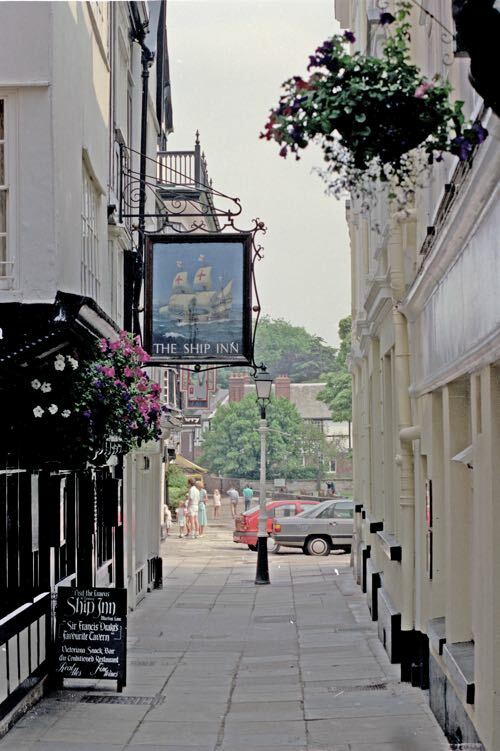 The Ship Inn in Martins Lane, just off Cathedral Yard, is one of Exeter's more iconic tourist attractions. The sign shows a typical 16th Century ship leaning heavily to port. 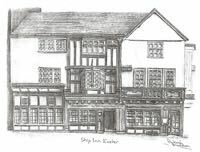 Don't expect a genuine 16th Century interior - it is 'modern antique', although the upper floor shows many levels that indicate its age. Perhaps the sign should read 'Ye Olde Shippe Inn' for greater authenticity. Although Historic England state it is 16th Century, it is probably 15th Century. Substantially rebuilt in the 19th Century, and into the last century, the overhanging timber front and gable has been restored. The carving on the front is not old. 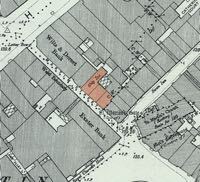 The building was just outside Martins Gate, the remnants of which can be seen on the wall of the corner building. 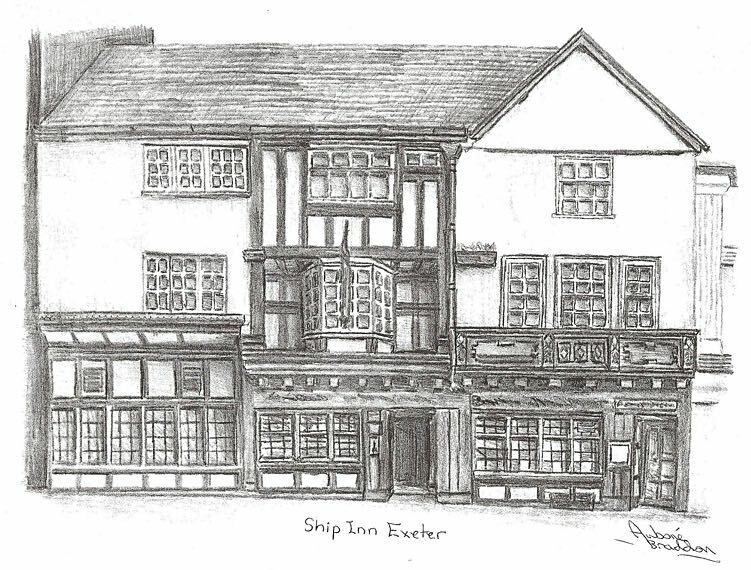 "Next to my own shippe I do most love that old Shippe in Exon, a tavern in Fyshe Street, as the people call it, or as the clergy will have it, St. Martin's Lane"...."There yester'en I had some speech with a mariner fresh come hither from Plymouth. The power of Spain is already afloat, so in the morning please God, I am for Plymouth and for another shippe than this". It's a nice story but very unlikely, and there is no evidence of the original letter existing. The owner of Mol's Coffee House, Thomas Burnett Worth is probably responsible for promoting Sir Francis Drake as a frequent drinker at the Ship, to increase tourism to his gallery at Mols Coffee House. Sir Walter Raleigh, the local boy from Budleigh Salterton had closer connections with Exeter; his parents lived in Palace Gate, and his father involved in civic affairs. Raleigh may have supped ale in the city, with or without Drake, but there is no definitive proof. 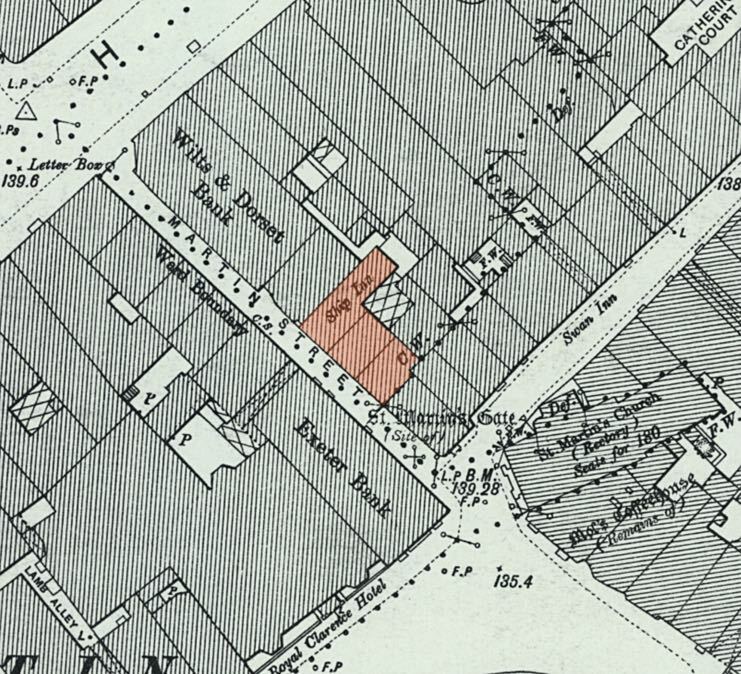 "I have quartered my men at the Ship in St Martin's Lane, an excellent place with good wine, victual and forage." In 1719 the Ship was threatened by an unruly mob who tried to burn it down because they thought clergy, who were in alliance with the Whig Government, were being sheltered there. A group of soldiers had to be used to quell the uprising. 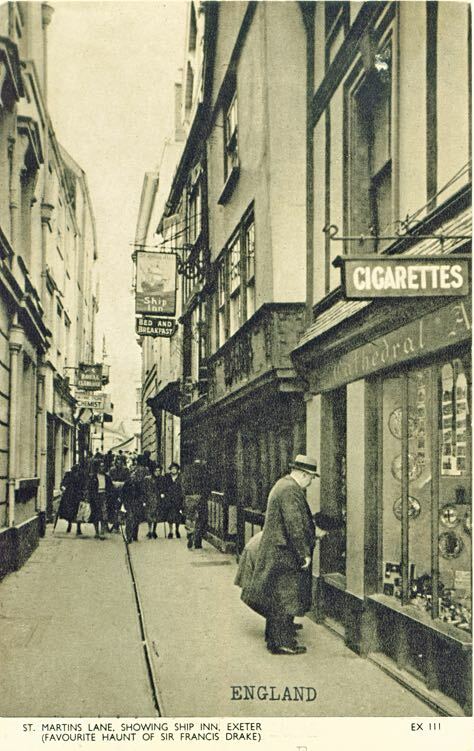 Martins Lane was also known as Luxury Lane, as well as Fyshe Street. 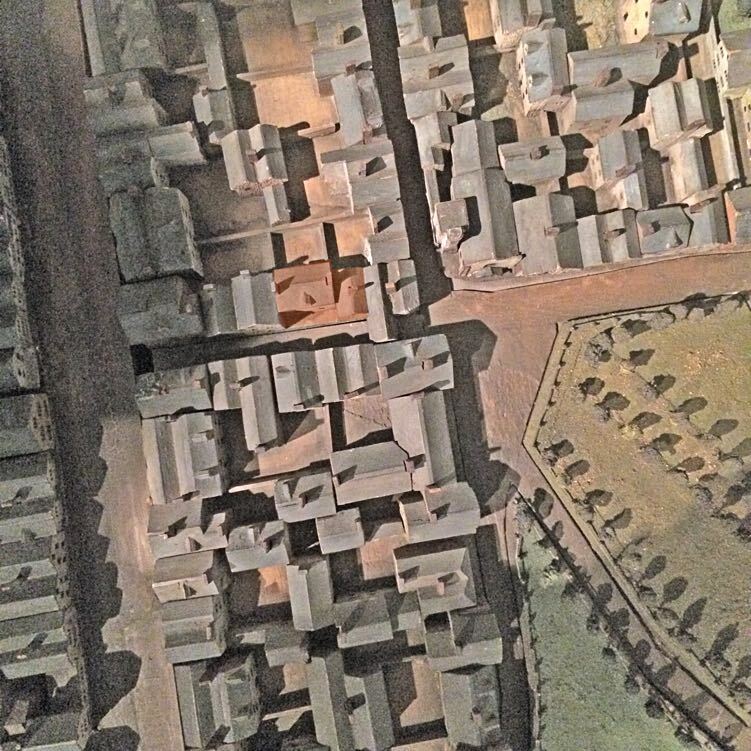 It is surprising to us, when looking at how narrow it is, that stage coaches once passed along its once cobbled surface towards Cathedral Close. The landlord from 1917 was a Mr W E Taylor – in August 1920, his wife had the distinction of being the first Exeter lady to loop-the-loop. The aircraft, piloted by Mr H W B Hansford, took off from the Pinhoe Aerodrome, circled the City three times before performing the loop-the-loop at an altitude of 3,000 ft. Which brings us up to the 20th century. The landlord, in November 1939, Mr R Pring, owned a black spaniel called 'Sam' that became well known to the patrons of the Ship through the war. He would greet customers at the door, fetch glasses and allegedly took glasses of beer and pasties to customers seated at the tables. Once the order was safely delivered, the customer was expected to pay Sam with the correct coinage, which he would flip into his mouth and then drop them into a tin behind the bar. Sam's skill was used to raise money for the Spitfire Fund, War Weapons Week, Salute the Soldiers and other worthy causes, in Britain's hour of need. His record take in one week was £23 which he delivered to the Mayor's parlour. He was said to be fond of beer, which along with the dog biscuits, was sufficient payment for the canine bartender. Sam became well known and had many GI friends, although one sour Yank thought it funny when he heated up a penny in the fire – the unsuspecting San flipped it into his mouth, only to yelp and spit it out, suffering burns to his tongue that took several days to heal. The Yank was promptly barred from the Ship. When Sam died, the local paper ran an obituary which included "Sam is dead ... Sam, the pedigree black cocker spaniel, darling of mine host Reg Pring and of mayors, civic dignitaries, Tommy, Jack, G.I. Joe, and the Land Girl." Sam's seven month old son, Punch, was said to be at "... the journeyman stage of carrying letters and newspapers for his master. Punch also likes his sup of ale." In 1964 the two lower bars were knocked into one and the pub started serving meals when the upstairs rooms were converted for a restaurant. Again, in 1994 the premises were refurbished which bizarrely led to the Shipski (if that is what it was called). A Russian visitor paid £2,700 for all the fittings and fixtures to fit out and open the first English pub in Kaliningrad. Who needs Drake with a history like that. 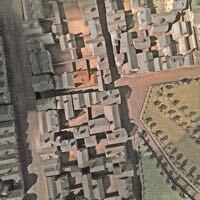 Source: Exeter Unveiled by Todd Gray, The Lost City of Exeter by Chips Barber, historical Express and Echo clippings. Historic England. The Ship Inn from the north, looking towards Cathedral Green. A popular subject for postcards, despite the oblique view. 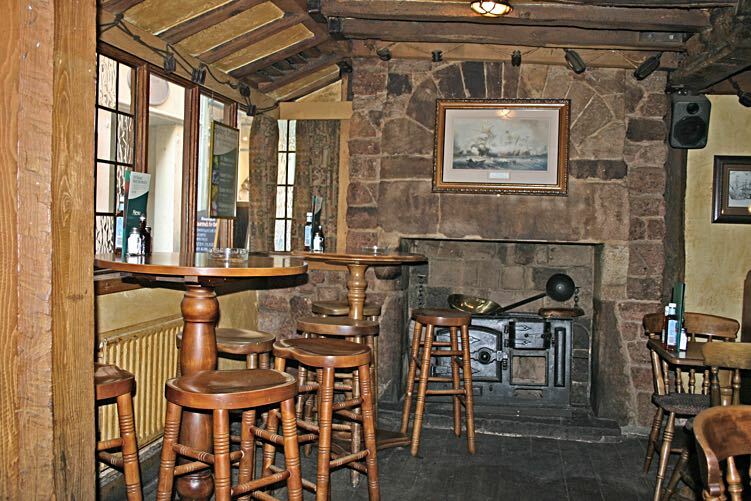 The interior bears little resemblance to a 16th Century inn. 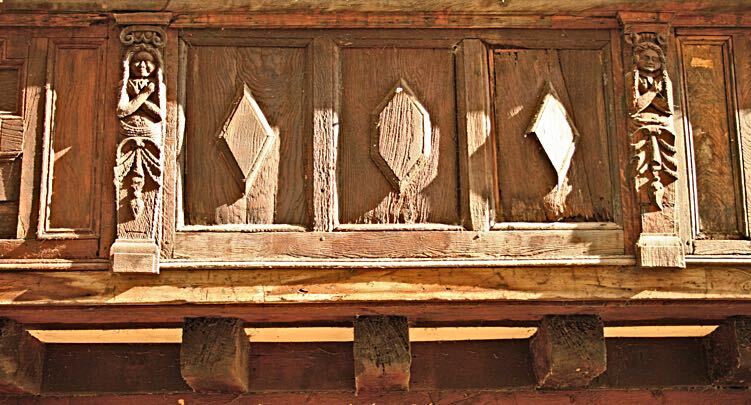 Decorative carving on the exterior–whether it has any age is debatable. 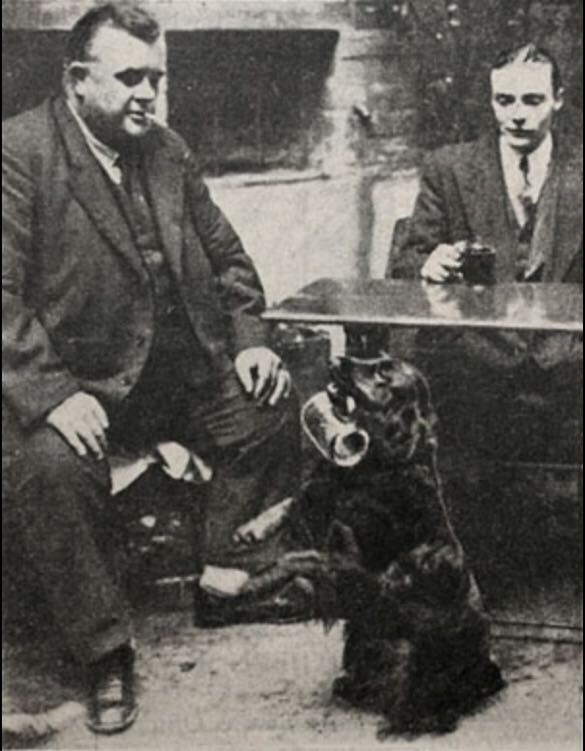 Sam the dog in 1939, helping at the bar. This drawing by Aubone Braddon shows the facade of the building. The Ship, tinted red in the Hedgeland model at the museum. Note Martins Gate immediately right.